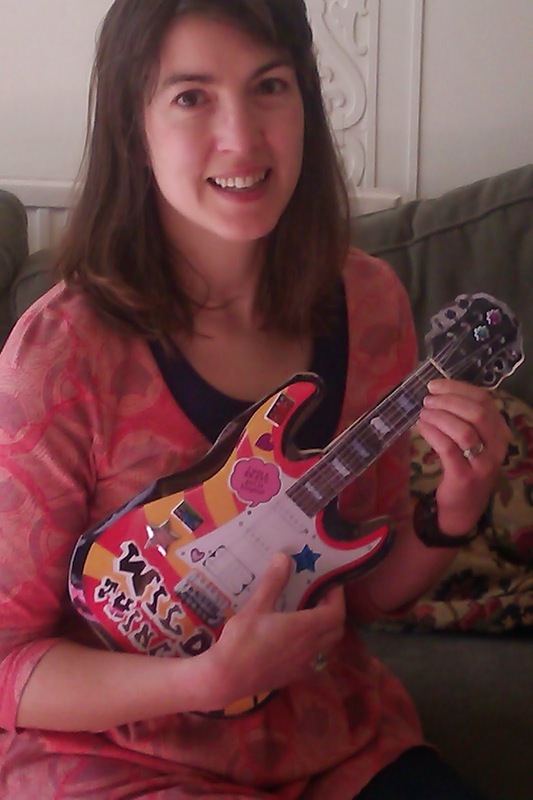 In October 2012, my agent forwarded me this wonderful, shiny, hand-made, sticker-covered guitar. It was part of the offer she had just received from Scholastic to publish my book, Wild Thing. I was thrilled. I had first dreamt up Wild Thing in the Spring of 2010, and I had poured a lot of energy, enthusiasm and sheer hard work into that book. I was delighted it had found a home. I was also immensely touched that the editorial department had come up with such a lovely way of offering for the book. I reckoned they must really like it (either that or it had been a really slow day in the editorial department). In fact they did like it, because not only had they offered for Wild Thing, but for two sequels too. I had been commissioned to write a series! At that moment, one of my writing ambitions came true. I’ve wanted to write a series for a while. I think that’s what children like reading (I certainly did) and besides, having invented Wild Thing, older sister Kate and their crazy world, I didn’t want to leave them behind. It was intimidating though. Suddenly I didn’t just have one deadline, I had a raft of them. The next eighteen months were all mapped out with writing, delivering and editing Books One, Two and Three. As I near the end of that process (Wild Thing was published last month, the third Wild Thing book is now in its final stages) I can say it’s been breathless, but great fun. If I was nervous about sustaining the characters through three adventures, I needn’t have been. The second book almost wrote itself. Perhaps this was not surprising – by now I understood the characters so well. So what is it that allows a book to become a series? 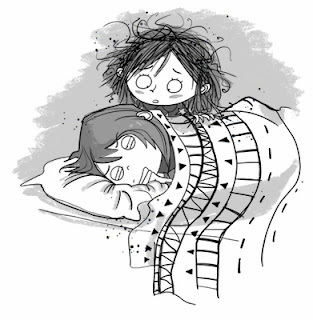 Wild Thing is pitched for 8+, and is the story of two sisters and their somewhat chaotic lives and adventures. I suppose in publishing terms it fits in with many of the other character-led series for this age group. That also means it's got some very impressive competition! What most of these series have in common is a real-life setting and fairly everyday adventures: which means that the characters have to be strong enough and distinctive enough to sustain the series. In my case, the main characters are two sisters. Kate, the elder is fairly sensible. She is driven to distraction by the exploits of her little sister Josephine (aka Wild Thing) who is only five and not sensible at all. "Why can't we send Wild Thing to prison, though?" I said to Dad. Dad laughed. "I thought you wanted to sell her." I found I understood those sisters pretty well. Perhaps that’s not surprising. I’m an elder sister myself. Sibling relationships are one of the universal themes of childhood, but other aspects of Wild Thing are more unusual. An older child writing about a much younger child is risky – because the common wisdom is that children prefer reading about characters older than themselves. Maybe so. But one of the things I’ve enjoyed about the series is that a younger child (Wild Thing is five) can get away with more than an older child can. It’s great fun writing about someone who can say and do what she likes. I hope that the readers will share that same vicarious pleasure. Also, not many children are being brought up by a single parent rock guitarist dad. But again, that works for the series. A musician can be around in his children’s lives, but also absent (and absent-minded) and all kinds of chaos can ensue. The real test though is what happens when the books reach the readers’ hands. Does it speak to them? That’s something that will take a while to discover. What do you think makes for a successful series? 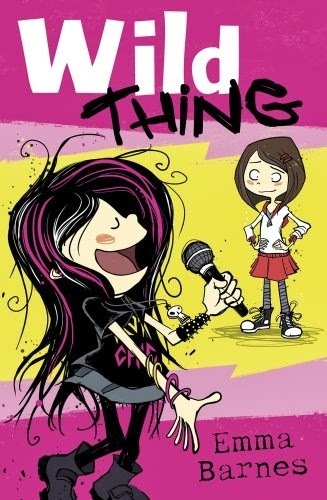 Emma's new book, Wild Thing, about the naughtiest little sister ever, is out now from Scholastic. It is the first of a series for readers 8+. Never fear - your readers will love 'em! I started with a series - and I really like them. You really get to know the characters and the setting, and then writing more is so much easier than inventing a whole new world. When I had to turn to a new one, I tore my hair out for a year before it came together! Wild Thing looks great, by the way... and what an impressive way of getting a publishing offer! Great blog, interesting to see how it all came together. Love the guitar! What a great memento of the offer! The series looks a lot of fun, Emma, I am sure it will do well. Really interesting to hear how the series came about - and yes, what a lovely idea the guitar was!